Famous people born on July 5, are considered to be a Cancer who is quite dreamy. They dream of wealth and living the good life. However they need to do more than dream. They’re resourceful and have many interests and hobbies that could turn out to be lucrative careers. Additionally, they are like the group leader. In saying that it is meant that famous July 5 celebrities seem to take on the role of the caregiver or authority figure. They are a positive individual who dislikes scenes or fighting. As a part of being who they are, they find it offensive and won’t participate in any negative activity. When it comes to their job, famous July 5 born take it seriously. They prefer to have some sort of fulfillment from the job they do as opposed to hating their work. They take pride in the things they do. Exercise is not one of their favorite hobbies but they seem to keep looking good but as they get older, they should reassess their diet to maintain what they have. 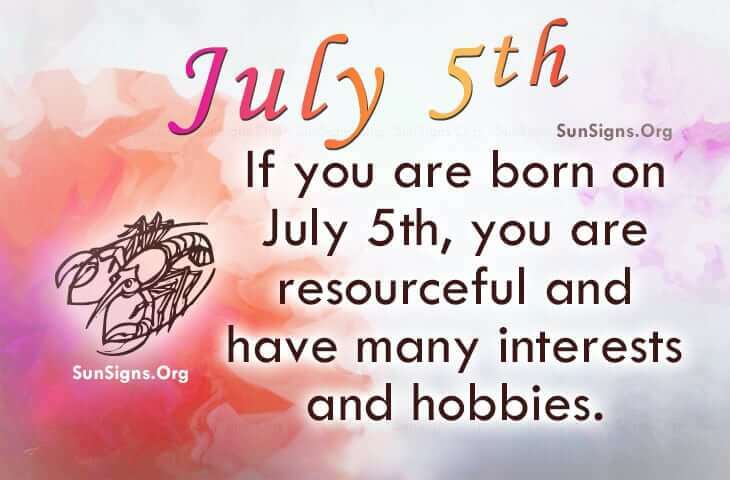 Famous people born on July 5th you are likely to be a role model that’s close to family and have a secure place within those ties. They are a genuine Crab who perhaps lacks the drive to go the distance although incredibly delightful.